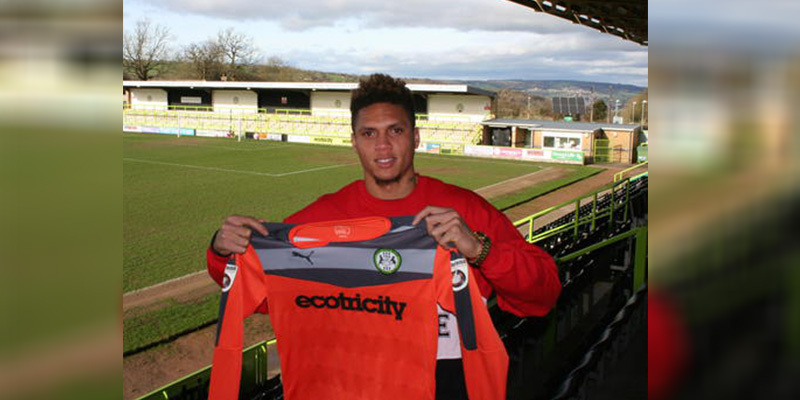 Bermudian goalkeeper Dale Eve has signed with Forest Green Rovers Football Club, which is based in Gloucestershire and plays in the National League. The club’s announcement said, “Goalkeeper Dale Eve has re-signed for Forest Green Rovers on a contract until the end of the season. The Bermuda international has returned to The New Lawn to provide competition for Steve Arnold, with Jonny Maxted currently recovering from a broken foot. “Eve had a loan spell at Forest Green earlier this season, and has now agreed a permanent deal after his release by Premier League club Stoke City. In his earlier spell this season he appeared in FGR’s televised FA Cup fourth qualifying round victory over Margate. “Born in Bermuda, the 20 year old moved to England as a teenager to join Derby County, where his talents saw Stoke City offer him an opportunity at the Britannia Stadium. “He was sent out on various loan spells with the likes of Fleetwood Town, Nuneaton Town, Newcastle Town and Congleton, as well as his short stint at FGR earlier in the campaign. Well done and a hearty congratulations!! !